Mission San Miguel Arcángel, sixteenth in the Chain of California Missions, was founded on July 25, 1797 by Father Fermin Francisco de Lasuén and named for Saint Michael the Archangel, the "Most Glorious Prince of the Celestial Militia". The location was chosen two years earlier and provided an additional stop on the two-days journey between San Antonio de Padua Mission and San Luis Obispo Mission. The chosen spot was in a magnificent location on the Salinas River where a large number of Salinan Indians inhabited the area. Indeed, one of the goals sought by the Spanish missionaries with the construction of the new mission was to evangelize these Native American tribes. 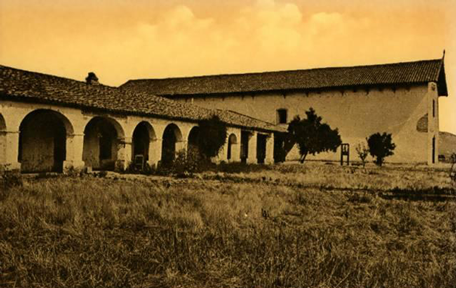 Since the beginning, Father Buenaventura Sitjar was put in charge of the construction of Mission San Miguel Arcángel. On the day of the mission's founding, Father Sitjar baptized 15 Salinan youth. The Franciscan missionary had good relationships with the Salinan Indians and fluently spoke their language having previously ministered to the Salinan people for 25 years at Mission San Antonio. The construction of the mission church was started in 1797 but in 1806 the church burned down while still being developed. At this time, more than one thousand converted Indians were living at the Mission. Soon after the burning, preparations were made for the construction of a new adobe church storing tiles and adobe blocks but it took another 10 years before the construction of the new church was started. Eventually, the new church, still visible today, was founded in 1816 and completed in 1821. Three years later, the magnificent frescos designed by Esteban Munras and painted by the local Salinan Indians under Munras' direction were also completed along with the interior decorations. Today, Mission San Miguel Arcángel has one of the better preserved interiors among all the missions. The church measures 144 feet long by 40 feet high and has 28 sugar pine rafter beams in the ceiling. The walls are covered with brightly colored murals showing false perspective, and trompe l'oeil pillars, balconies and designs of leaves and tassels. Above the altar is an "all-seeing eye of God" with its rays of light shining in all directions. The everlasting glow of color, which has withstood both the passage of time and the attempts of restorers, is due to techniques used in early days. The paint was either applied with a glue made of cattle bones or painted fresco-style on damp plaster. Other than that, Mission San Miguel has an unusual arcade, with each arch slightly different in size, just like the life-sized building. San Miguel was the last of California Mission to be secularized by the Mexican government on July 15, 1836. In 1846, the Mission was sold by Governor Pío Pico for $600. In 1859, President James Buchanan returned San Miguel Arcángel Mission to the Catholic Church. Major restorations, which renovated the main mission buildings, were undertaken between 1901 until 1928. The Mission became an active parish church of the Diocese of Monterey until on December 22, 2003, the San Simeon Earthquake seriously damaged the mission buildings. Restorations works have since been completed and the mission reopened on September 29, 2009. Today, San Miguel Mission stands as one of the finest California's cultural treasures and it is located at 775 Mission Street, in the small charming town of San Miguel, California.